Renewables will be the fastest growing source of energy between now and 2040, according to new projections from the Energy Information Administration. The EIA forecasts that from 2012 to 2040, solar, wind, and geothermal production will nearly double, rising 97 percent. The next closest projection is for natural gas, which is expected to grow 56 percent. Of course, renewables make up a small proportion of global power generation. So even after all that growth, renewables are estimated to account for a measly 3.8 percent of total energy production in 2040, compared with 38 percent for natural gas. But this is actually an extremely conservative estimate. 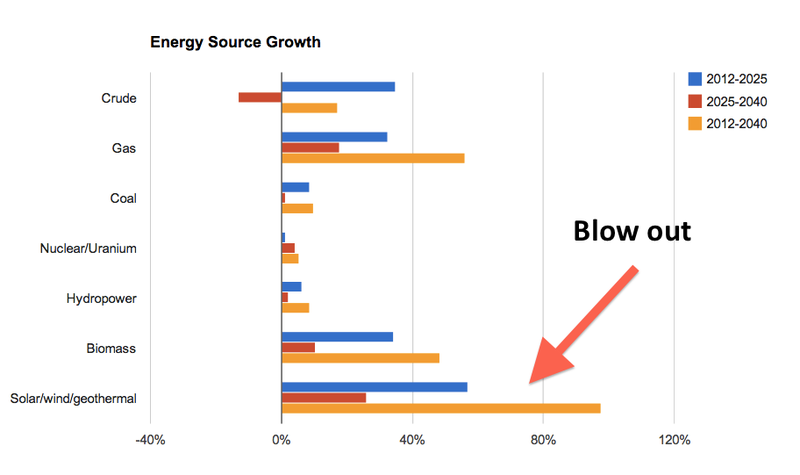 Renewables — and especially solar — aren't really like other energy sources. Non-renewables are energy-rich fuels, but there is only a finite supply in the ground. This means that prices are unpredictable and subject to large spikes that badly damage the economy, as occurred in the 1970s and the 2000s. Renewables are not limited by discoveries. They are instead derived from ongoing natural processes — the sun shining, the wind blowing, the heat of the Earth's core. Their use is limited by technology — our ability to capture and store the energy. And the evidence shows that the technology is improving continuously, and fast. That's one steep and long trend of falling prices. And there are new innovations in the pipeline that will improve the technology even more — in September a research team in Europe unveiled a solar cell with a world record 44.7 percent efficiency. Nanomaterials are being developed that may be able to boost solar panel efficiency from efficiencies typically below 35 percent to as high as 80 percent. If the trend of falling prices continues for another 10 years, solar-generated electricity in the U.S. will descend to a price of $120 per MW/h — competitive with coal and nuclear — by 2020, or even 2015 for the sunniest parts of America. If the trend continues for the next 20 years, solar costs will be half that of coal (with the added benefits of zero carbon emissions, zero mining costs, and zero scarcity). Obviously, generating solar or wind energy is useless if it cannot be stored for when the sun goes down and when the wind stops blowing. But new battery technologies are making it vastly easier to store the energy produced from renewables. Lithium-ion batteries are already large and efficient enough to run a sports car, but lithium-oxygen batteries can store energy at much higher densities, giving electric cars a much larger range, and hugely increasing solar storage capacities. Graphene vastly reduces the time required to charge a battery, to the extent that an iPhone with a graphene battery could be charged in five seconds. A research team at Stanford announced this November that they had developed a self-healing battery, which does not degrade over many cycles of charge. The promising trends in technology and cost suggest much more than renewable energy becoming the fastest growing energy source in the next 30 years. They suggest that renewables will grow to be the number one energy source in the United States and the world in the next 30 or 40 years.